Check Out The Awesome Cover For GODZILLA: HALF CENTURY WAR #2 | Birth.Movies.Death. 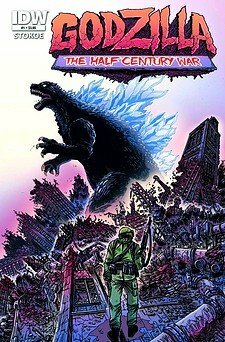 IDW has been publishing new Godzilla comics lately, and their most recent miniseries is Godzilla: Half Century War by James Stokoe. I've seen some of Stokoe's Godzilla art and have been mightily impressed. The concept for the miniseries is pretty cool, too - it's about a group of soldiers tasked with testing out experimental weapons on Godzilla, and each issue takes place a decade after the last one. That means each issue will riff on a different era of Toho kaiju history. hit stands earier this month. The main image on this article is from issue 2, which should be out in September.